Mid Century style is big in Interiors and a great way of introducing this is by accessorising. These sculptures add a unique point of difference to a room and are sure to elevate you in the style stakes. A cozy throw is an absolute must as we head towards the warmer months. 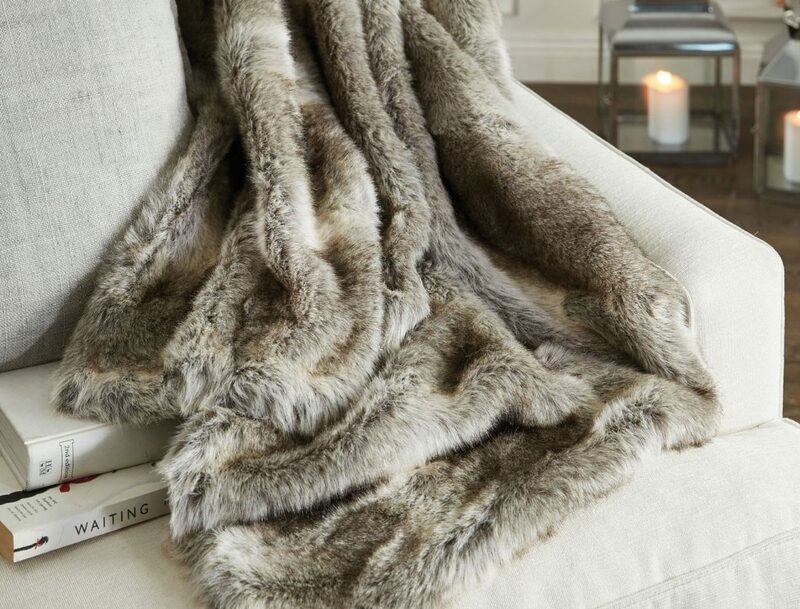 Look no further than the classic fur throw, oh-so-luxe and great for adding texture and warmth to any room. Bring a little Scandinavian inspiration through your decor. This mirror is the perfect addition above a brass alcohol trolley or mantle piece. If you’re looking to add a luxurious texture, velvet is the ‘it’ fabric for homewares. This simple cushion in a deep khaki hue from Orson & Black will add an eye catching splash of this on trend texture. Everyone needs a place to keep the day to day scraps in check. Why not do it in style with this brass pin board, giving a nod to the metallic trend as well as creating a home for those pesky bills and random magazine clippings that you have floating around. For a real touch of cool, neon lights may not be the first thing that comes to mind but these are actually making a comeback in interiors in a very stylish way. For an eclectic and edgy look these are a must, not to mention these will be a guaranteed talking point of your next house party. If you haven’t already, upgrading your bedding to high quality 100% linen is the best way of adding luxury to your bedroom. And while you’re at it why not be a bit more adventurous and go for this earthy blush hue. Bedding is all about layering, so mix this in with other natural tones to update a neutral palette. Lighting makes such a difference in enhancing the mood of a room. Add these to a cozy corner in your living room to create a warm and inviting reading nook, or either side of your bed for an elegant statement. This marble and brass combination is sure to add a touch of luxe to your space. Every room needs a statement piece and cushions are a great way to achieve this because you can update them season after season for an instant refresh. This one from Husk is the perfect combination of texture and print that will sit comfortably in any style from boho-chic to modern monochrome. For a cheap and cheerful addition to your living room look no further than this side table. Proof that you don’t need to spend hundreds to make your home look a million bucks, when shopping for budget wares be sure to look for quality finishes and contemporary designs to avoid looking cheap and dated. Mix high end with low for a style that is uniquely yours. If you’re in need of an injection of character in your space an accent chair is a great way of making a statement. Cane is soon to be the next big thing in interiors and will add a natural softness to any contemporary space that will instantly make it feel more warm and inviting. Pining for marble background Instagrams without the dollar signs? Make this simple marble tray your centre piece and your cocktail snaps will look twice as good. Brilliant gold glazed vases will add a playful decorative accent to your home, especially when in the shape of fruit! It’s a simple way of incorporating florals next to your marble finishes to heighten the luxurious feel. Use these refined seagrass baskets for everything from storage to planting or even for your laundry. Mixing with multiple sizes also works well to create a corner nook of greenery! Bring the cocktail bar home with this classic Art Deco style drinks trolley in a brass finish. Style this offside to your kitchen or next to your dining table for added entertaining. If you aren’t into utilising it as a drinks trolley, add stacked magazines and photo frames for a personal touch to your home.